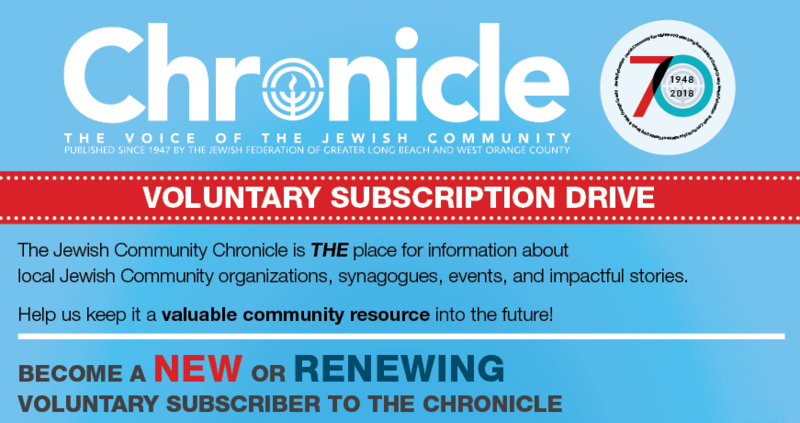 The Jewish Community Chronicle, the Federation's monthly community publication, is your source for local and global Jewish news. We keep readers in touch with Jewish Federation and Jewish Community Foundation activities, JCP partner agency and community events, and news of interest. Full service advertising is available, please see below for more information. To receive the Chronicle via email. Introduce your message to well-educated homeowners and professionals with high discretionary income and buying power. For over 70 years, we have delivered news and information about our local and global community, providing a unique marketing opportunity for businesses that want to reach our amazing demographics. A big advantage for our advertisers/partners is that we are a full color monthly publication delivered to 7,000 households in the Greater Long Beach and West Orange County area. It is also placed at 15 synagogues and community organizations, as well as made available for the over 40,000 people that annually visit the Alpert Jewish Community Center on the Weinberg Jewish Federation Campus. The Jewish Community Chronicle is a contemporary and accessible source of information, events, vital services, and public announcements. As the leading local Jewish magazine, we are eagerly awaited by our readers, meaning your message gets noticed. It is THE place for information about upcoming community events. Your business or organization will benefit greatly from being in the Jewish Community Chronicle. WANT TO REACH OUT TO OUR JEWISH COMMUNITY? PROMOTE YOUR BUSINESS IN THE CHRONICLE!